In the early 1800s, Catholics of the Loretto-St. Francis area had to walk or ride a horse to neighboring towns for Mass. In 1854, Dutch Father Francis Wuyts, who was appointed to care for the spiritual needs of several surrounding parishes, began to offer Mass in Chicago, the original name for St. Francis. By 1959, under his direction, men of the parish had completed a small, frame church building on a hill. Father John Creary, the first resident pastor, built a rectory. In 1880, the first parochial school, called St. Clare Academy of Chicago, opened; in the 1880s the rectory in use today was built. 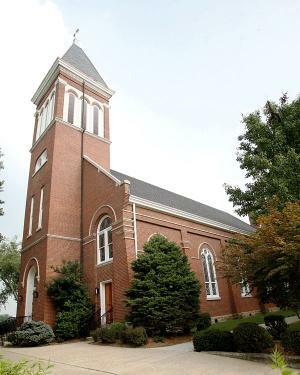 A new brick church replaced the frame building in 1887, and the present, solid-brick building was dedicated December 27, 1900. Many parishioners labored tirelessly to make it a reality. St. Clare Academy of Chicago closed in 1958 when a new school and chapel in Loretto became available until 1991, when it, too, closed. St. Francis High School in Loretto, now used as a parish activity center, educated teens from 1951 to 1970. When the original convent at St. Francis burned in 1959, a new convent, now St. Francis Nursing Center, was built and ready for use in 1959. Today with about 1,100 parishioners, St. Francis is clustered with Holy Cross, both parishes sharing one pastor and operating out of a parish office in Loretto. St. Francis is the focal point of the community and is a place where parishioners are in touch with their roots and with their Catholic heritage in this “holy land” of Kentucky.